So I found this on twitter or facebook one day and I posted it up on tumblr and it’s one of my most noted posts thus far. It seems to be a message that most of us can appreciate. And well I tend to get a bit distracted at times with things like tumblr and other random pursuits *coughs*Bubble Witch Saga*coughs* and I know, I know that as someone who wants to be published I just shouldn’t be wasting time on things like this. I’ve learned from experience the only way to write regularly is to actually write regularly. If I go for a few days without doing it, then it becomes harder to get back to, but if I do it, really force myself to write something even if it seems the muse isn’t there, it becomes easier. And that was true last week. I sat down and made myself write something and soon I’d knocked out 3,000 words even though it had taken forever it seemed to write the first two sentences. Okay so 3,000 words isn’t a normal day tally for me. Years ago I got told to set 500 words a day as my target. Now a days I’m trying to work with 10,000 words a week as a target. I’ve managed it for two of the weeks since I set that target. Though I’ve been stalked by a head cold for most of that time. 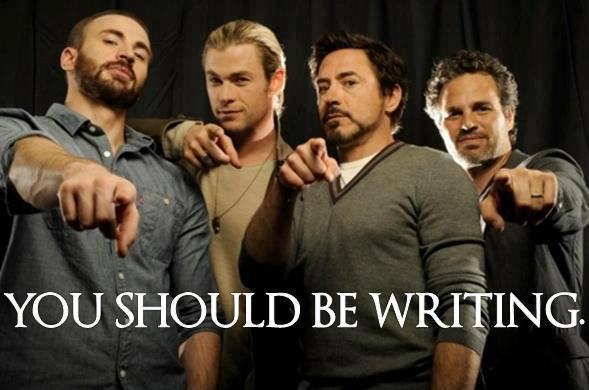 But the trick is I’ve got to keep writing and not get distracted. And in the times when the muse isn’t playing then I don’t waste my time popping bubbles, I waste my time on things that will inspire me. I need to read more, research more, even watching movies, in my opinion at least, can help get the creative juices stirring. Or TV shows, especially ones like the old Frank Black, Millennium which inspires basically every time I watch a couple of episodes. My trouble lately is finding a book that keeps my attention. I have a million and one books (only a slight exaggeration, I’m close to being able to open my own, albeit very small, library.) But I struggle to find a book that I can sink my teeth in to. I’m not sure why. It’s been a problem for about a year now. When I get in the mood I devour books. I think I got through the first twelve books of the Anita Blake series in about two weeks when I got into the right mood. It’s just finding that mood and the right book. So yes, I really want to read right now, but I have no idea what. Currently sitting staring at me I have books by James Rollins, Charles de Lint, Robert Holdstock, Clive Barker and Marion Zimmer Bradley all sitting waiting to be read, that is not to mention all the books I have on my phone/computer to read aka the kindle app. But I am struggling to read that way due to the whole stuffy head thing going on. Ah yes, excuses again. But honestly if anyone can get in my head and tell me what to read, please do. I need to read almost as much as I need to be writing. I’m sure this is a common enough problem, I’m just not sure how to overcome it. See, this winter has been the worst for getting sick since I was maybe 16 and milking every illness to get out of classes. But this year I’ve picked up every bug that has come my way, perhaps it is underlying health issues (most likely) and I know about those and those are being worked on but the side effect has been that every time I so much as sniffle these last few months the muse decides to go and lock herself in a bubble and refuse to come out for most of the time I’m sick. This frustrates me to no end. Stuffy sinuses and fuzzy head and no distraction getting lost in the worlds of my own creation equals one grumpy and frustrated writer. Was there a point here? Well yes there was, I again have a head cold that I am in the process of trying to exorcise from my body like a unruly demon, but in the mean time I want to write, I have the time to write and I can’t. Colour me frustrated. Anyone know a good priest for exorcisms so I can speed this along and get to writing. I have the ideas just no muse to give me the right words. So if you follow me on twitter you will have heard in passing about some of the projects I am working on. I write a lot with my cosy brain space sharer Sam. We have story after story in the pipelines and are working hard to keep inspired and most of the time to keep on task. I write with a couple of other people, mostly in a Role Play way, but some might see the light of day as novels, short stories or something at some stage or another. The rest is all on me to do. Above I’ve linked a couple of pages that will get more detailed and sorted out as we come closer to the stage of publishing. I have a number of stories I am working on solo, and sometimes it is really hard to stay focused on my own stuff, I am easily distracted by the pretty shiny new idea, or the one that is being written in tandem because it is easier to stay focused when there is someone else involved, especially if you do not want to disappoint that person or your muse. My two main solo focuses at the moment are Eiridis and Nyssa’s story. Nyssa ties back in to the Children of the Immortals series I am working on with Sam, but has decided that she has her own story to tell and that I have to tell it. I’m doing pretty well on it too, I’ve managed to write about 40,000 words so far for her and there is still much more to come. Go me…or rather go Nyssa, really I’m just the scribe. If I can get focused maybe by the end of the year Nyssa and Eiridis will be at the editing point, or for Eiridis at the re-edit point. My biggest problem really is getting to that stage which is why I have so many other novels sitting there half finished, the muse having thrown up her hands at me with them for lack of focus and effort. If I can get these two finished as well as some writing with Sam, I will know I can do it and who knows, maybe then the muse will return to my past efforts and they too might see the light of day. Not my most unique blog title but fitting enough. I am pottering around and trying work this out. A place that shows the more professional author side of me as I work to get myself published and work to get Sam and I published. This will take some effort to get this place the way I want it to be, so your patience, understanding and at times help will be most appreciated.